Success does not breed longevity. This is especially true in music. Take a look at some of the biggest acts to have come on the scene, from boy bands to one hit wonders. This is an industry where you must constantly stay relevant, and while it should be solely about the music, that statement does not always hold to true. The same goes for collegiate a cappella. Groups are more in flux than professional artists. And while our community’s success barometer is not as cut and dry as the one attached to mainstream music, we do have our indicators. 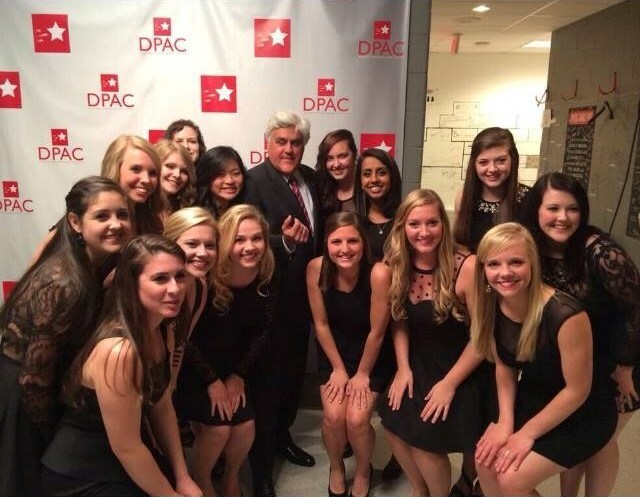 This can be anything from ICCA appearances, CARA awards, BOCA track features, and most currently online video views. And when you observe some groups who’ve made appearances at early ICCAs and on earlier incarnations of BOCA compilations, you’ll notice that they are no longer thriving organizations. So, what is it? What’s the key to keeping a group going for decades? A key to the formula must lie in something deeper than just the music alone, right? Well, fortunately for us, we don’t have to wonder. 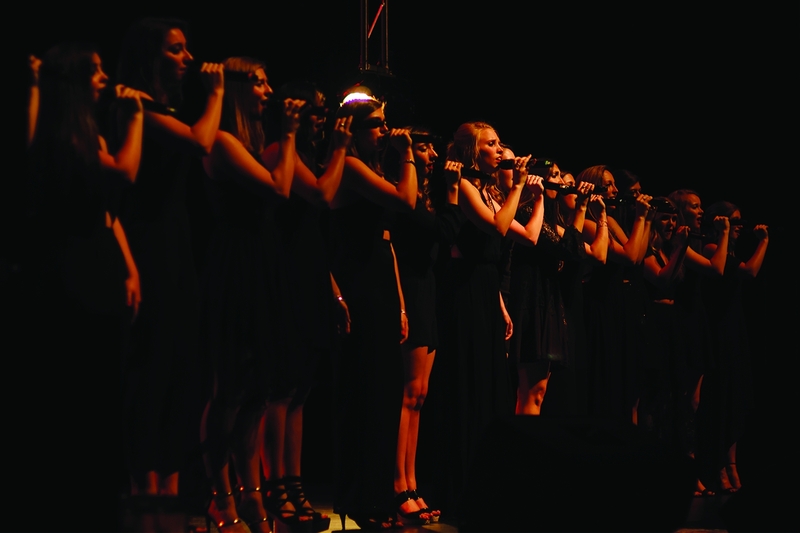 This year, a staple of the a cappella community just hit a major and historical milestone. 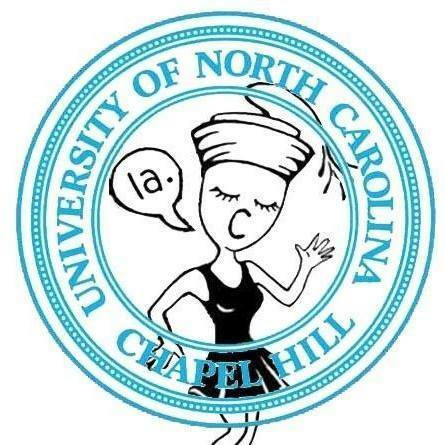 The Loreleis from the University of North Carolina at Chapel Hill are celebrating 35 years as a hallmark on both the UNC campus and in the a cappella community. The group’s early years can only be looked on as a simpler time, as the group only featured a four-song repertoire that focused on choral-sounding music. 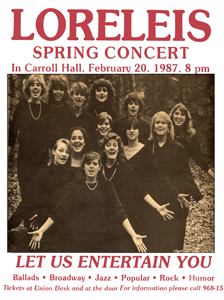 It was in 1986 that the ladies began adding vocal percussion to their set, thanks to alum Margaret Moore. As time progressed, the Loreleis found themselves exploring more varied styles, ultimately arriving at the sound we know and love today. The group pulls from many genres including pop, alternative, jazz, hip-hop and many more, making sure to maintain a balanced set. The Loreleis also have a special tradition when it comes to deciding on songs to perform as they try to include both a throwback song from years past, along with at least one classical piece. For these reasons, such influences like that of Top 40 music, oldies, and even Eric Whitacre can be heard through the group’s arrangements. It is in these minute details that you become aware of how longevity comes into the picture. For the Loreleis it is in these musical traditions, or in other rituals, such as inviting all Lorelei alumni backstage before every show to wish current members good luck. Unfortunately, these were the only traditions the Loreleis were willing to let us in on. We’ve been told that the rest are top secret! But great groups do not simply keep to themselves. It’s also in the external facets that keep an organization thriving. For the Loreleis, this comes in giving back through performances at charity events, collaborative shows, and even through their annual Fall tour as they travel along the east coast performing in states that include Georgia, South Carolina, Maryland, and Virginia, among others. It is the personal meaning behind why we perform that drives groups such as the Loreleis to commit to this art form and the desire of sharing it with others. While the group recognizes that membership can be fleeting, it’s the shared passion of music and singing, and the social traditions, that connects and bonds every Lorelei that has ever been. And the Loreleis are taking the time to connect and honor this momentous occasion. From a reunion cocktail, back in March at Crunkleton in Chapel Hill, to a grand 35th Anniversary Concert, the group has pulled out all the stops for their fun-filled 35th Anniversary weekend. Gatherings like this only happen every five years at anniversary concerts with alums, so it was necessary to go BIG for an event of this magnitude. So, the group could sit back and relish on the fact that they were the very first ICCA Champion (known back then as the NCCA), which acts as an intrinsic motivator to set the personal bar high for everything they do, but they’d rather spend the time creating even more history and cementing even more musical and personal bonds. For the Loreleis, it’s about creating moments and traditions, along with a whole lot of giving back to a cause greater than themselves. To the Loreleis, congratulations on 35 years, and here’s to many more yet to come! You can learn more about the Loreleis here.